Can you send me the picture of national costume of jamaica? Please see the picture above. Thanks to flickr. "The traditional folk dress is a well loved costume of Jamaica. 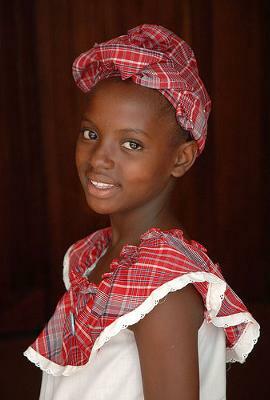 It is a beautiful outfit of red and white plaid cotton material which is worn for Independence Galas and other holidays in Jamaica by ladies. There have been various designs of this costume worn by all Miss Jamaica World Contestants but the the most constant is the bandana skirt and the bandana head tie in red and white plaid. Jamaican men also wear this costume in a shirt with white pants and a bandana head tie." Hi can you send a picture for the Jamaican national costume for boys I need it for their u.n activity. i am a true jamaican and i do not have a one so can so can you please send me a copy. can u pls send me the full picture of national costume of jamaican from head to toe coz i need it very soon tnx a lot.